In this powerful verse from madhya lila Mahāprabhu describes the process of devotional service to Sri Sanatana Goswami. In the beginning He describes the truth about the living entity and the super excellence of devotional service. He then describes the uselessness of mental speculation and mystic yoga. In all circumstances the living entity is recommended to accept the path of devotional service as personally explained by Śrī Caitanya Mahāprabhu. The speculative method of the so-called jñānīs is considered a waste of time, and that is proved in this chapter. An intelligent person should abandon the processes of karma-kāṇḍa, jñāna-kāṇḍa and mystic yoga. There are sixty-four items listed in regulative devotional service, and out of these sixty-four the last five are considered very important. What is most amazing is if we analyse how Srila Prabhupada made the structure of ISKCON. Now I realise why so many senior devotees always stress that we have to remain in ISKCON, serve the local temple, do our sadhna bhakti and we will surely make progress in our spiritual life. 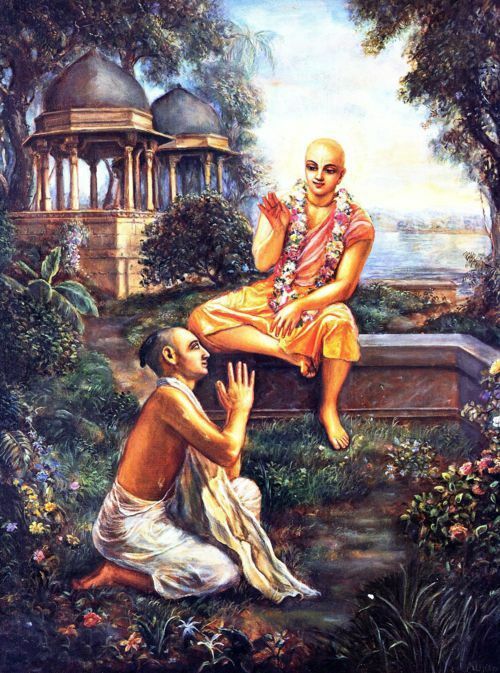 I offer my respectful obeisances unto Lord Śrī Caitanya Mahāprabhu. He is an ocean of transcendental mercy, and although the subject matter of bhakti-yoga is very confidential, He has nonetheless manifested it so nicely, even in this Age of Kali, the age of quarrel. This entry was posted in ISKCON, Mahaprabhu, My spiritual Journey and tagged Bhakti Charu Swami, Caitanya Mahāprabhu, chanting the holy name, deity worship, dhama vasa, five top limbs of bhakti, Gopal Krishna Goswami, importance of Srimad Bhagavatam, ISKCON, Krishna, maharaj Ambrisha, Sadhu Sangha, Sanatana Goswami, Srimad Bhagavatam. Bookmark the permalink.